Habit: Densely to loosely cespitose; rhizomes stout. 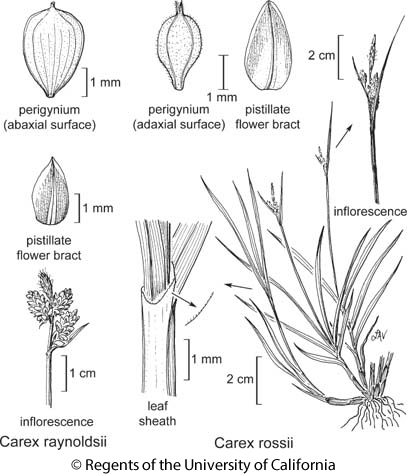 Stem: 7--40 cm, generally ascending, scabrous on angles, base generally not very fibrous. Leaf: exceeded by to exceeding inflorescence; blade 0.8--4 mm wide, stiff or not, +- flat, bright or gray-green. Inflorescence: inflorescence bract generally > inflorescence; staminate spikelet of taller inflorescences 4--10(12.8) mm, 0.7--2.5 mm wide; nonbasal pistillate spikelets 2--4; pistillate flower bract green or tinged +- red, awned or not. Fruit: 1.9--2.4 mm, 1.3--1.7 mm wide; peri 3--15, 3.1--4.5 mm, 1.1--1.7 mm wide, beak 0.7--1.7 mm, teeth 0.2--0.4 mm. Ecology: Dry forest, meadows; Elevation: < 3800 m. Bioregional Distribution: NW, CaRH, SNH, SnGb, SnBr, MP, W&I, DMtns; Distribution Outside California: to northern Canada, Colorado, Arizona, scattered to north-central United States. Fruiting Time: May--Aug Note: Report of Carex geophila in SN evidently based on misidentification. Synonyms: Carex novae-angliae Schwein. var. rossii (Boott) L.H. Bailey; Carex geophila Mack., misappl. Unabridged Note: SN report of Carex geophila in FNANM evidently based on specimen at MICH of Carex rossii. Citation for this treatment: Peter F. Zika, Andrew L. Hipp & Joy Mastrogiuseppe 2015, Carex rossii, in Jepson Flora Project (eds.) Jepson eFlora, Revision 3, http://ucjeps.berkeley.edu/eflora/eflora_display.php?tid=17785, accessed on April 19, 2019. NW, CaRH, SNH, SnGb, SnBr, MP, W&I, DMtns; Markers link to CCH specimen records. Yellow markers indicate records that may provide evidence for eFlora range revision or may have georeferencing or identification issues. Purple markers indicate specimens collected from a garden, greenhouse, or other non-wild location.